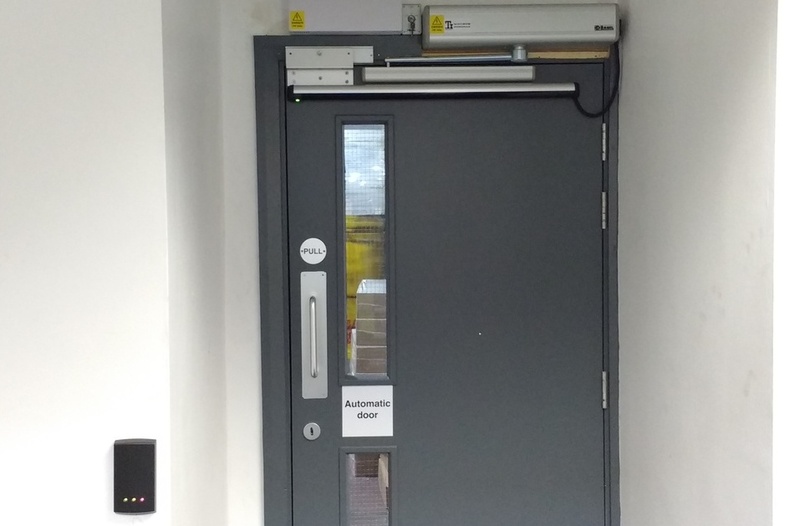 At Last…business Automatic Door systems done properly! You’ve finally found the security company that can provide the very best in Swing and Sliding Automatic Door systems – no matter what your objectives, we can assess, design, install, upgrade and maintain the highest quality business automatic doors to protect and enhance your organisation. You want a commercial Swing or Sliding Door system and service levels you can trust – and with 5 decades in the Access and security industry, you can guarantee that our knowledge will keep you safe and compliant. You’ll get 100% honest and transparent advice from our experienced consultants, giving you complete peace of mind that your premises, staff and visitors are fully safeguarded and that people can enter, exit and move around your premises efficiently. During your free site visit, survey and assessment, our experts will take the time to listen to your needs in order to understand what security success looks like for your operation, integrating your commercial Automatic Door system with innovative Access Control capabilities to create an unparalleled bespoke solution – whether you operate from a single or multiple sites. 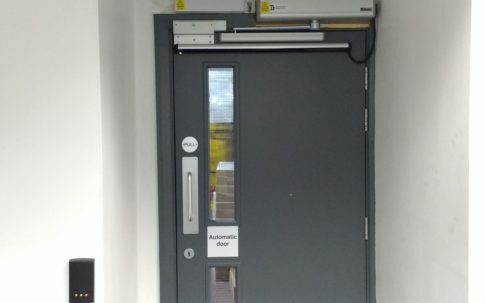 Most of our clients come to us either to Automate an existing Swing door or install a new commercial Sliding Door – along with additional Access Control functionality. Many also request a system take-over due to poor service performance from their previous partner. Often used to facilitate ease of access for those with disabilities, such as reduced mobility or strength. While un-automated doors can be too heavy to push open and pretty much impossible for wheelchair users to navigate, existing Swing Doors can be converted to automatic to remove these issues – this is also a more cost-effective option than having a bespoke Sliding Door installation. Sliding Doors are ideal for larger openings, and can be installed side-by-side as a pair to further increase entry/exit space. These also offer an attractive aesthetic, but they need space either side in order for the panels to slide into place on opening – all of our Sliding Doors are completely bespoke to fit your requirements. Depending on the security risks or staff/visitor monitoring requirements of your business, you can choose from a fantastic range of Access Control functions, including biometric readers, fingerprint and facial recognition and proximity readers. You can increase your security by integrating your Automatic Door with your business Intruder Alarm system, and our exceptional monitoring and response facilities. You can also have Automatic Door systems installed throughout your business premises for disabled access and controlled environments. If your entrance is busy with regular, high footfall, we can set your doors to open at a faster rate to ensure things keep moving at a steady pace. If you often receive deliveries, or work in an industry where staff are constantly carrying items in and out of the premises, Automatic Door systems save time by allowing entry without the need to put items down, prop doors open and retrieve items before moving through. As your Swing Doors open, the hinges become exposed and the gap creates a trapping hazard, so we fit hinge protectors as standard. We also provide you with safety sensors, which identify if somebody is located within the opening arc, preventing the door from operating and making potentially damaging contact with the person. 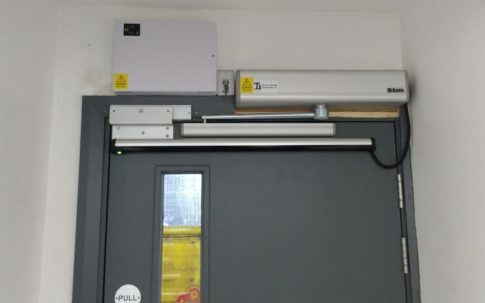 Similar sensors can also be fitted where the doors open up towards a wall or panel, mitigating the risk of the trap zone that is present at 90° in these circumstances. Both Swing and Sliding Doors are fitted with push-to-exit buttons and Sliding Door systems are also fitted with sensors (as above) to prevent accidents. Additionally, as a trapping hazard is present where the door slides into the wall, we can install either a glazed unit or a glaze half height section to mitigate this risk. We can powder coat your Automatic Door frames and surrounds in your brand RAL colours, and we can also include your logo in the face of the glass for a professional finish. For a smooth and efficient installation, we also provide you with all electrical works, provided by our experienced, registered electricians. Larger businesses with higher staffing levels are more likely to employ individuals that require access and mobility considerations, such as wheelchair users. In these situations, in order to meet your legal obligation to comply with the Disability Discrimination Act (DDA), you may need to install commercial Automatic Sliding Doors or Swing Doors to allow ease of access into and out of the building, and perhaps within the interior of the premises too. 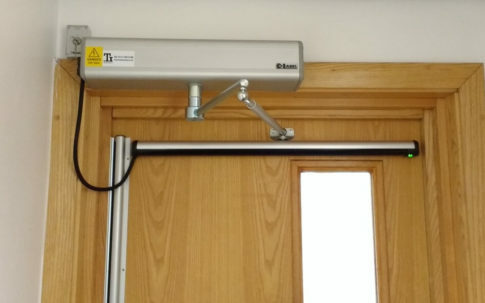 Because Automated Swing and Sliding Doors can be fitted with a range of Access Control solutions, you can reduce the risk of unauthorised people entering your building, and monitor everyone who comes through your doors – while also creating an auditable log of attendance to help your HR department and payroll activities. Risk of visitors accessing sensitive areas is mitigated and subsequently, potential liabilities for safety and insurance. Work areas such as laboratories and food production areas come with a range of health and safety requirements. 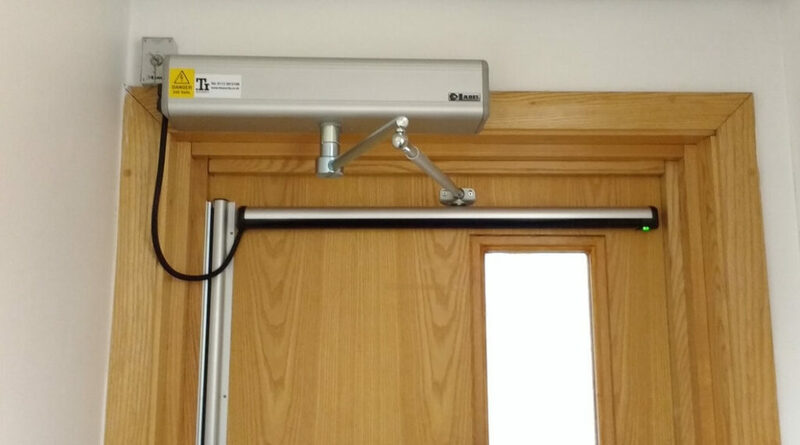 Door handles and push plates can provide an easy way to transmit and spread infections and bacteria, so an Automatic Door system removes this risk as there’s no need for physical contact when gaining entry. A double door solution can also provide an air lock in environments where this extra level of hygiene is required. Maintaining a consistent ambient temperature in your reception or lobby area improves working conditions and ensures a warm welcome for any visitors. Commercial Automatic Sliding Doors or Swing Doors stop the warm air escaping and the cold air entering – which improves your air conditioning system, as it won’t have to work harder (costing you more money) to control the temperature. Glass door systems also allow more light into the space, for an airier and brighter atmosphere. We provide a fully comprehensive service, integrating with your Sliding or Swing door systems with your Access security network, powered by sophisticated software. While these systems can be pretty complex, we simplify the process by handling all technical elements directly with your IT department – giving you an efficient and reliable installation without any hassle. We’re happy to utilise your current IT model, including Cloud access for monitoring and management, and can integrate any existing or new products in one professionally managed project. You’re sure to have lots of questions about how our commercial Automatic Door systems can help your business, and to ensure you’re choosing the right supplier – so we’re happy to be put in the firing line during a face-to-face meeting, where you can ask us all your questions so we can address and overcome any concerns. We offer flexible leasing on all our Automatic Door systems, helping you manage your cash flow, increase tax efficiency, fix your costs and ensure you have the best and latest equipment. Agree what access requirements we may have and coordinate them with your production and operations team to ensure there is minimal or no impact on your business. We’ll also liaise and work with your site maintenance department and any other internal and external contractors and partners. You need to know that any data traffic and software integrated and introduced to your network is safe and secure. As one of the leading Automatic Doors companies, we won’t expose your business to cyber risk, and our team will work in conjunction with your IT specialists. We can provide a Program of Works, agree Permits to Work and Method Statements according to your specific site requirements. Got a question about Automatic Doors?